Creative nonfiction—the fastest-growing writing genre in the publishing world—means true stories well told, communicating ideas and information in an accessible narrative form to enlighten and inform general readers. 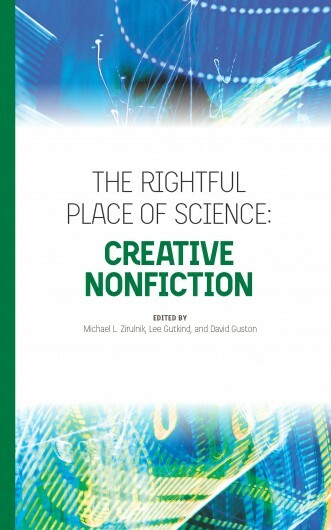 The stories in this collection present expert knowledge about science, technology, and innovation policy in an accessible, story-oriented way, without the use of buzzwords and jargon. Creative nonfiction as exemplified here is becoming increasingly important as scholars attempt to connect with and influence a wider, more inclusive audience. Elizabeth Popp Berman is an associate professor of sociology at the University at Albany, SUNY, and the author of Creating the Market University: How Academic Science Became an Economic Engine. Adam Briggle, an associate professor in the Department of Philosophy and Religion Studies at the University of North Texas, is the author of A Field Philosopher’s Guide to Fracking among other books. Ross Carper is a writer based in Washington State whose publications include fiction, poetry, and narrative nonfiction. Roberta Chevrette is a Ph.D. candidate in the Hugh Downs School of Human Communication at Arizona State University. Her research focuses on rhetoric, cultural studies, gender and sexuality, and public memory. David Guston is a professor in the School of Politics and Global Studies and co-director of the Consortium for Science, Policy & Outcomes at Arizona State University. Lee Gutkind is the founder and editor of the literary magazine Creative Nonfiction, the Distinguished Writer in Residence at the Consortium for Science, Policy & Outcomes at Arizona State University, and the author or editor of more than thirty books. Gwen Ottinger is an assistant professor in the Center for Science, Technology, and Society and the Department of Politics at Drexel University. She is author of Refining Expertise: How Responsible Engineers Subvert Environmental Justice Challenges. Angela Records is a consultant with Eversole Associates, a global science and technology firm based in the United States. Sonja Schmid is an assistant professor in Science and Technology studies at Virginia Tech. Meera Lee Sethi is a Seattle-based writer who is currently pursuing graduate studies in ecology. Sara Whelchel is a medical student at the GRU/UGA Medical Partnership in Athens, Georgia. Michael L. Zirulnik is a research associate at the Consortium for Science, Policy & Outcomes and a Ph.D. candidate in the Hugh Downs School of Human Communication at Arizona State University. He is Chair of the Peace and Conflict Communication Division of the National Communication Association based in Washington, DC. Rachel Zurer is senior content editor at Backpacker magazine in Boulder, Colorado.